Joint work with Craig Huneke. This paper contains two theorems concerning the theory of maximal Cohen-Macaulay modules. The first theorem proves that certain Ext groups between maximal Cohen-Macaulay modules M and N must have finite length, provided only finitely many isomorphism classes of maximal Cohen–Macaulay modules exist having ranks up to the sum of the ranks of M and N. This has several corollaries. In particular it proves that a Cohen-Macaulay local ring of finite Cohen-Macaulay type has an isolated singularity. 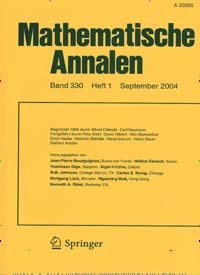 A well-known theorem of Auslander gives the same conclusion but requires that the ring be Henselian. Other corollaries of our result include statements concerning when a ring is Gorenstein or a complete intersection on the punctured spectrum, and the recent theorem of Leuschke and Wiegand that the completion of an excellent Cohen-Macaulay local ring of finite Cohen-Macaulay type is again of finite Cohen-Macaulay type. The second theorem proves that a complete local Gorenstein domain of positive characteristic p and dimension d is F-rational if and only if the number of copies of R splitting out of R1/p^e divided by pde has a positive limit. This result generalizes work of Smith and Van den Bergh. We call this limit the F-signature of the ring and give some of its properties. This was the first paper that Craig Huneke and I wrote together, shortly after I got to Kansas. It’s got two completely separate sections, one about Ext groups and one about rings of prime characteristic. I thought of the first section as being essentially about rings of finite Cohen-Macaulay type, but Craig saw that it was really a theorem about how Exts behave. Like all of his best theorems (and like our result in On a Conjecture of Auslander and Reiten), it’s an effective result, in that it gives more precise numerical data than is a priori needed. In retrospect, I almost wish we’d published this first part separately – I think it’s important enough to stand on its own, and even to get placed in a very good journal. The second section was my first introduction to thinking about tight closure, and I’m still very pleased to have been able to bring something to that theory.